The Outstanding in the Field (OITF) dinner series is perhaps the ultimate expression of the farm to table movement for those of us who don't or can't grow our own food in a backyard garden. The dinner series, the brainchild of Jim Denevan, the founder and former Santa Cruz area chef aims to "re-connect diners to the land and origins of their food." The series, a "roving culinary adventure," makes its way across the continent hosting dinners on farms, ranches along coastlines or in large urban gardens. The aim is to allow diners to greater appreciate that food comes from a place, and that these places deserve our attention. This year my wife and I were lucky enough to grab tickets to the dinner at Carnation, Washington's Full Circle Farm. Nearly all of these events sell out; some in only a matter of hours. The dinner, which served 140, was prepared by Lark's Johnathan Sundstrom, an OITF veteran, using local ingredients from Full Circle Farm, Alvarez Farm of Yakima Valley, and Lopez Island's Jones Farm. The wine pairing was provided by Yakima Valley's Gilbert Cellars and were poured by winemaker Justin Neufeld and cellar master Geoff Howell. 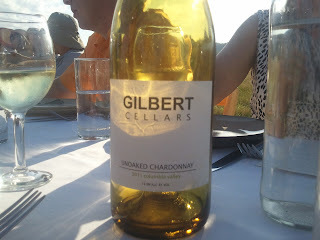 Gilbert Cellars makes a variety of both single varietals and blends and have developed a reputation for delivering very nice wines for incredibly reasonable prices. The guests' arrival was greeted by Justin and a glass of the 2011 Gilbert Cellars Rose of Mourvedre paired with two appetizers; a smoked mackerel crostini with Dinah's cheese, tomato lavender chutney, and marcona almond; and a pork rillette from Jones Farm with red wine cherries. The Gilbert Cellars Rose is another fine example of how the Northwest is bringing pink wine back into the serious wine lexicon. The Rose of Mourvedre was crisp and light, with a lip smacking acidity and melon flavors that made it a perfect food accompaniment. The dinner guests plowed through it. After the appetizers, Andrew Stout the founder and farmer of Full Circle Farm, took us on a tour of their facilities. He and his wife Wendy began the endeavor 15 years ago on 3 acres. 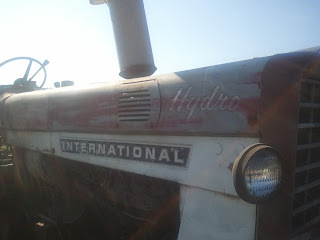 In that time it's grown to hundreds of acres at a few different locations. Their emphasis is on habitat preservation, organic, seasonal and appropriate crops. The farm has grown to quite an operation working mostly direct to consumer along with some specialty grocers in the Seattle area. To diversify their direct to consumer, organic produce delivery they work with local and West Coast farms to provide customers with quantities and varieties of produce to meet their needs year round. We wrapped our tour and headed to the table; set up in a semi-circle in the middle of an open field. Seating was family style and we ended up next to one couple from Los Angeles, one from Philadelphia and, as luck would have it, Geoff from Gilbert Cellars. Our first course was an incredible beet salad with lettuce, burrata (mozzarella injected with cream) and olive oil croutons. The meals are served family style and so becoming friendly with those who are sitting around you is a smart move on a number of levels. At the very least it will hopefully inspire a pang of guilt should they over-help themselves on any of the courses. This course was paired with a 2011 Unoaked Chardonnay from Gilbert Cellars, fermented completely in stainless steel. It's bright and crisp with aromatics of green apple and lemon. A palate cleanser and great wine for that creamy burrata. The second course was a grilled Yukon River Keta salmon. The fish was dressed with lemon mint butter and accompanied by asparagus, sugar snap peas and baby carrots. For Gilbert Cellars this was the trickiest of pairings. They were torn between their oaked Chardonnay and the Rhone style blend the Allobroges that they settled on. Geoff thought with the grill and a little bit of char on the fish they could pull it off. An unconventional pairing and yet one that definitely worked; the 2009 Allobroges, mostly Grenache, is lighter in body for a red wine with great flavors and acidity that allowed it to be paired with a meat as delicate as salmon. Our final entree was an insanely good pork loin from Jones Farm with smoked pommes de terre Robuchon, which is French for #$&! @ing delicious, along with garlic scapes, escarole and porcini mushroom sauce. Seriously, smoked mashed potatoes? This man is a genius. The good people at Gilbert Cellars brought the Left Bank to the table, a Bordeaux style blend that includes all five of the Bordeaux varietals. Geoff's take on the pairing was that the wine's "dark fruit core played well off the char on the pork loin" and the smoky elements of the mashed potatoes. Our dessert course was a candied ginger shortcake with a berry and lemon verbena whipped cream. For this course the wine, a 2011 Riesling from Gilbert Cellars, stole the show. The riesling demonstrated brilliant acidity, and a kiss of sweetness that would have made the Germans proud. For the winemaker, Justin, this final course was the best pairing as he felt the acidity of the raspberries gave the Riesling a particular vibrancy. For Gwynne and I, it was an outstanding meal, a special treat, from start to finish. From the food to the wine and the company. We left with a greater appreciation for how much work goes into creating the food that we eat, and what the impact can be, and at Full Circle getting to see the mindfulness and care that is taken with both the food and the land. 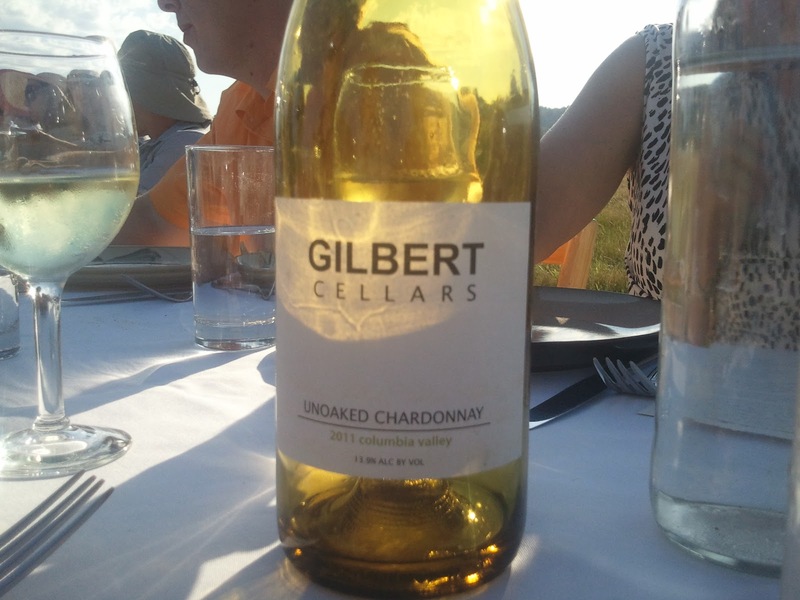 Gilbert Cellars was recommended to Outstanding in the Field by the staff at Lark, and it was a great choice, they're definitely producing wines with nice, approachable structure and prominent acidity that make for great food pairing. Geoff really found the whole concept behind what they're doing at Outstanding in the Field invigorating, saying, "the beauty and purity of the idea, and the commitment of the people who make it happen, to showcasing these farmers, chefs, and artisans within the context of the place where it all happens - the farm, vineyard, etc... - is extremely important. For people to see where the food is grown, meet the people who are growing it, and see just how much it takes to make it all happen - especially in a sustainable manner - really helps to further the cause and deepen the guest's understanding and commitment to the process. Truly Outstanding." Agreed.